LG announced its LG G3 smartphone this past week, and along with it, gave a teaser of the G Watch that the company plans to announce this summer as a device on Google’s new Android Wear wearables platform. The company did not show the G Watch, but provided a picture by way of its powerpoint screen (and a picture in the company’s teaser video) to whet the appetites of LG fans who are anxious to get the latest gadget in their hands. 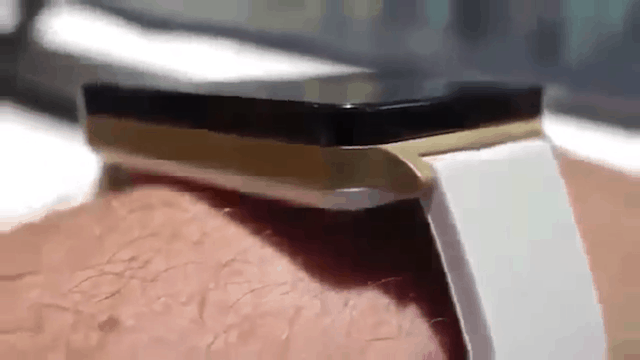 In a new video provided by Christian Görge, we get more than a glimpse of the G Watch – we actually get a long look at the device. The watch has a beige wrist strap with a black glass screen and notches that can be used to fit the wrist to your wrist (based on your wrist size). 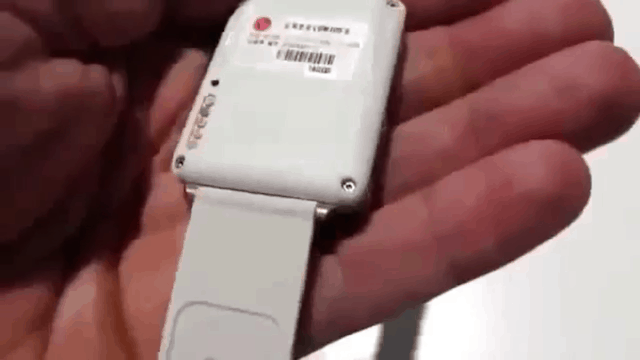 The back of the G Watch shows a number of screws that have been used in the device, with one at each corner (not counting a number of screws on the right side of the back of the watch). One would think that the G Watch provides a screen that is separate from the strap, but this is not the case; rather, the G Watch is connected to the main monitor by way of screws. The wrist strap is connected to the black display by way of a bronze color underlay placed right beneath the black watch face. The G Watch also comes with a “Google Now”-like user interface that provides a clear white background with some blue color icons on the screen. 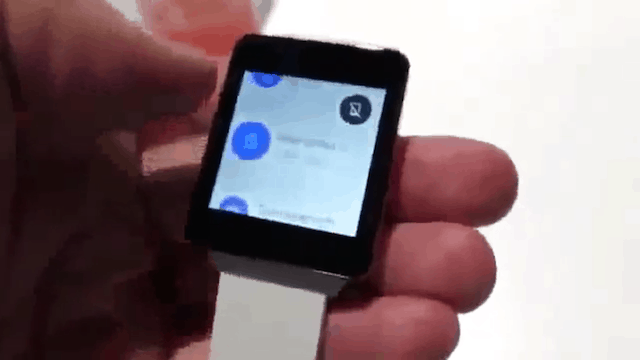 The clear white background is indicative of the Android 4.4 KitKat user interface, and we’re not surprised at this: the G Watch will be part of the Android Wear program of smartwatches, after all. When you arrive at the main part of the watch face, the screen is black but you can use gesture motions (swipe, for example) to “pull down” today’s date if you need to. The gesture motions that provide information with just a touch of the screen are meant to hide information until you need it. In other words, we get the impression that the G Watch doesn’t want to clutter the display. 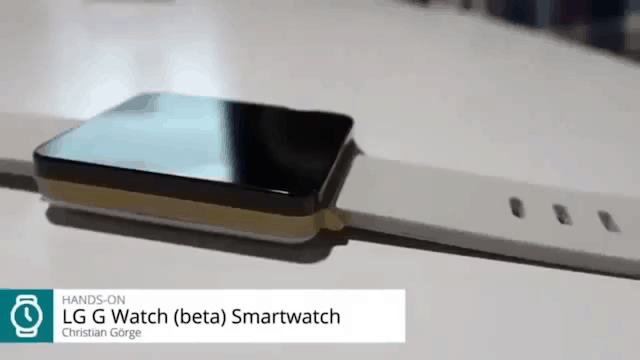 The G Watch looks like a solid smart gadget so far, but remember that it’s still in beta mode. 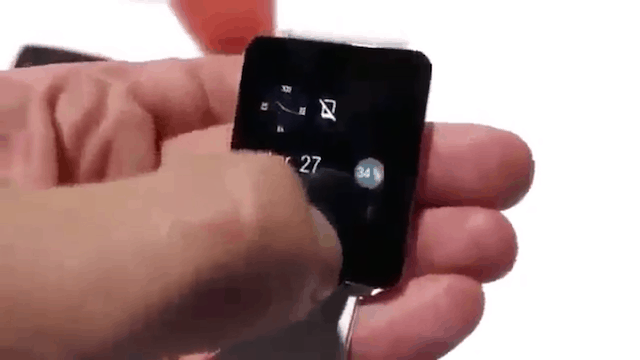 There are a number of things that could change between now and its release on the market, but it seems to mimic the same smartwatch that LG leaked at its G3 announcement – lending more credence to the German video. 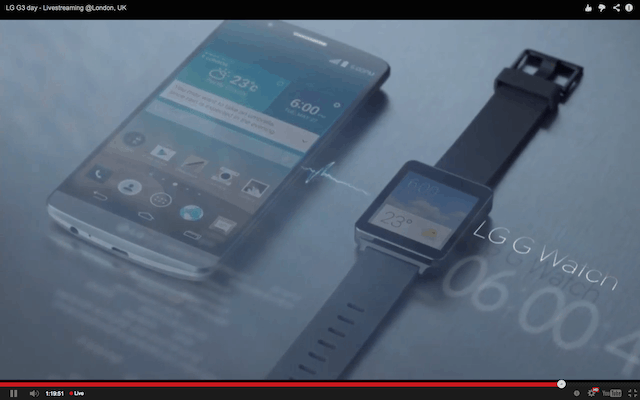 LG didn’t show its G Watch at the G3 announcement, but the company still provided a teaser video. If you didn’t catch the G3 announcement, we’re glad you caught this G Watch video. You can watch the G Watch video for yourself by going here. What do you think of the G Watch? Are you excited about the Android Wear platform and the array of watches like the G Watch and the Moto 360, for example? Which smartwatch has caught your eye so far?